Police arrest 24 people but say overall situation has not been "too bad"
LONDON, England (CNN) -- Police and protesters skirmished around the Bank of England on Wednesday as world leaders gathered for the G-20 summit. 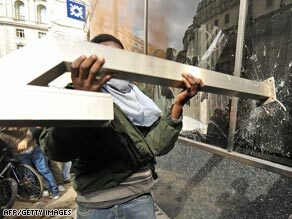 A protester smashes one of the Royal Bank of Scotland windows as scuffles threatened to escalate. Thousands of anti-capitalists, anarchists, and environmental campaigners descended for protests in several locations in London, including its financial center around the Bank of England, Britain's central bank. Protesters broke several dark tinted windows of a Royal Bank of Scotland building and crawled inside. They also spray-painted the word "thieves" and the anarchist symbol on the side of the building. The ailing bank has been the target of much anger following reports that its former chief executive was given a multi-million dollar pension payout despite overseeing record losses. Small fires were set in the crowd of about 4,000 and effigies of bankers burned. A CNN correspondent reported many of them were frustrated at not being allowed to leave the area. Eleven people were arrested for being in possession of police uniforms, a police spokesman told CNN. They had earlier been stopped while riding in an armored personnel carrier near Bishopsgate, close to the Bank of England. At least 32 people were arrested, including three at the RBS protest, police said. Demonstration organizer Marina Pepper told CNN that she was disappointed with the policing. "They definitely came looking to cause trouble," she said. This week's London Summit brings together the leaders of the world's 20 largest economic powers, known as the Group of 20, to discuss the global financial crisis and decide new measures to set the world on a more stable economic footing. CNN producer Simon Hooper reported a more festive atmosphere at the parallel protest by environmentalists outside the European Climate Exchange nearby, as protesters pitched tents for a "climate camp." They danced to drumbeats and ate lunches on blankets as part of a peaceful, festive protest. Despite the relatively good natured atmosphere, many shops in the area boarded up their windows and doors as the protesters, chanting "power to the people," got nearer. British comedian Russell Brand, who was at the scene, told CNN that "everyone seemed to be having a good time." Asked if we was there to help overthrow capitalism, he replied: "It's not my decision, I'm just here observing." Singer-songwriter and political activist Billy Bragg was also in the crowd outside the Bank of England. Meanwhile, a 17-year-old student, taking part in a protest, wore a balaclava to hide his identity. He described himself as an environmental protester and said things were "going into meltdown." He added: "The whole thing is collapsing. If we can't change things by democratic means then this is the way to go." Tamsin Omond, 24, told CNN that she traveled to London to "show my dissent at the system." She added: "Today is about showing that the old system hasn't worked. We need a new way of thinking about how we can solve the crisis." Ian Dixon, from Whitby in northern England, lost his job in manufacturing at Christmas. He said he has not had any work since. He said: "Gordon Brown doesn't realize how bad things are. Bankers have been rewarded for doing a bad job." At the start of the day commuter trains were quieter than usual, with many workers heeding police advice to "dress down." Many commuters seemed to carry on as usual despite the threat of the protests turning ugly. City worker Alan Rice, who was wearing a suit, told CNN: "Most people seem to be wearing dress down clothes but I've dressed for work like this for 40 years." He added: "I'm not overly concerned about the protests. I've got faith in the British system." Mike Wiltshire, who works in insurance, described how his daughter had said "Daddy please don't wear your tie today," before he left for work. But he added that he was wearing his suit "so police can distinguish him from the protesters." Wednesday's protest, organized by an umbrella group called "G-20 Meltdown," was to feature four separate "carnival parades," each led by giant "Horseman of the Apocalypse" puppets. A flyer for the event, carries the slogan "Storm the Banks!" and features images of French revolutionaries storming the Bastille in 1789 and a mannequin of a banker hanging from a noose. "We're going to reclaim the City, thrusting into the very belly of the beast: the Bank of England," the G-20 Meltdown Web site declared. Organizers of the protest insisted their intentions are "theatrical," promising "mirth, merriment and the love in our hearts" and urging participants to "bring food to share, water, tea making facilities, something to sit on, a pop up tent if you plan to stay late." But activists also published a map Tuesday with the details of scores of banks, financial companies, law firms and trading exchanges with offices in the City, prompting fears that symbols of capitalism could be targeted. "It is believed that the majority of the protesters intend to conduct a peaceful demonstration," the police said in a statement. "Businesses should however, remain vigilant at all times and ensure that buildings are secure." In the plush Mayfair neighborhood -- a few miles west of the financial center demonstrations -- protesters outside the U.S. Embassy were noisy but peaceful.